Hello! My name is Sarah—I’m a biology grad student from the University of Miami, and I’m studying hummingbird evolution and behavior. 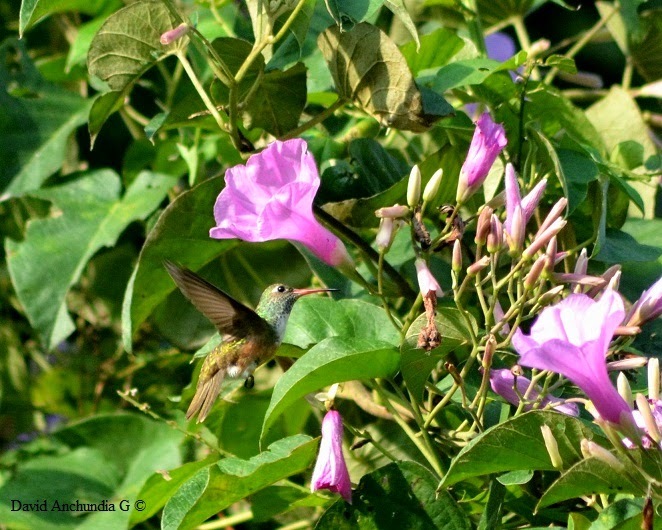 My research focuses specifically on Amazilia hummingbirds (the scientific name is Amazilia amazilia; el nombre en español es Amazilia ventrirrufa). 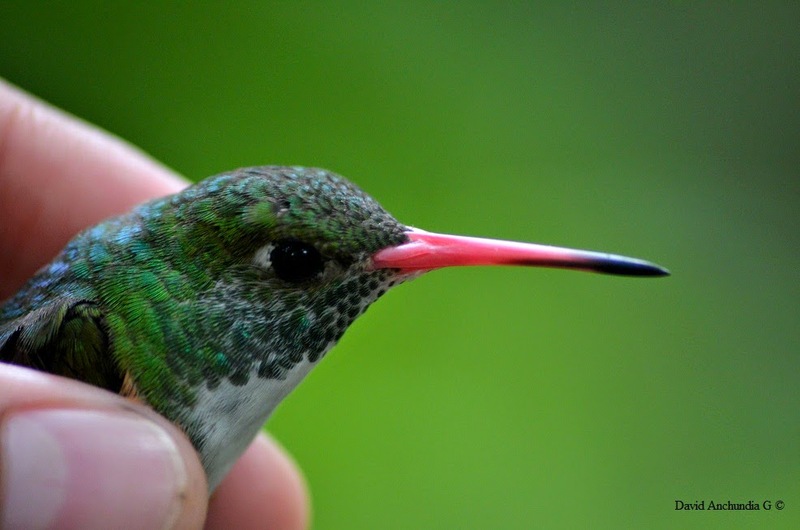 I am examining differences in plumage color across multiple populations of Amazilia hummingbirds throughout the South Coast and Southern Highlands of Ecuador. In addition, I’m planning to reconstruct the evolutionary history of this species. I’ve spent two weeks at Bosque Protector Cerro Blanco with my awesome field assistants David and Javier. 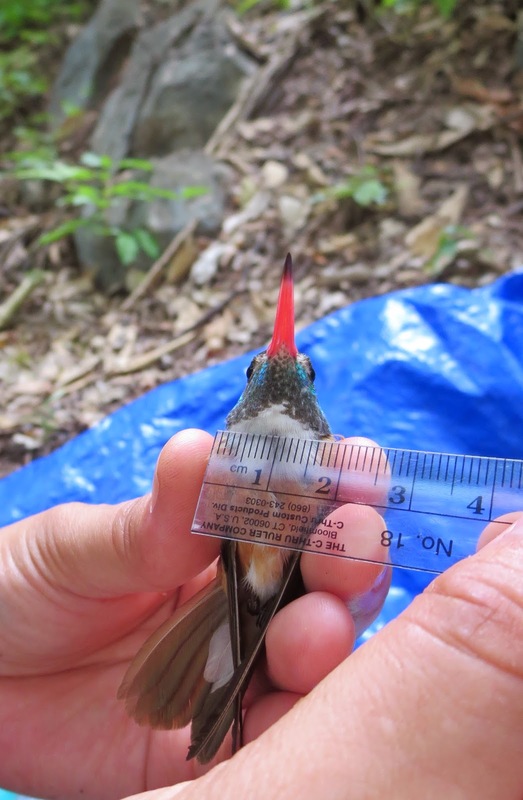 We’ve been capturing hummingbirds around the reserve using mist-nets, and taking morphological measurements, a few feathers (for later color measurements), and a few drops of blood (to extract DNA for phylogenetic analyses) from each bird before giving it some sugar water and letting it fly away. Here at BPCB, the birds are an emerald green color with blue-green gorgets and a rufous belly. We have been finding them around patches of purple morning-glory flowers in the reserve. The reserve is absolutely beautiful —a peaceful and quiet forest just outside of busy Guayaquil. We’ve seen tons of lizards, insects, spiders, snakes (including a viper! ), some small mammals, deer, and plenty of birds of course—from several big hawks to tiny hummingbirds, and everything in between. It’s transitioning from the wet season to the dry season right now, so there are a lot of falling leaves and soon to be flowers here. BPCB has absolutely been a wonderful place to do fieldwork in Ecuador!